Thousands of Bulgarians gathered in Sofia to pray for the release of the five Bulgarian nurses jailed in Libya. The unique mass prayer gathered for the first time ever three miracle-working icons all representing Virgin Mary. 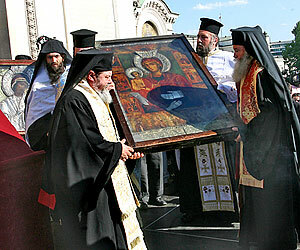 The icons were brought from the Rila, Bachkovtsi and Troyan Monastery to help the Bulgarian nurses and the Palestinian doctor. Over 200 clerics, headed by the country's Patriarch Maxim joined with prayers especially written for the occasion and mentioning each of the nurses by name. Alexander Nevski Cathedral, where the three revered icons are displayed, will stay open throughout the night and the priests promised to keep the icons for as long as there is a line of people willing to bow before them.